I generally find that I can't pre-determine my days. There's no way for me to decide in advance that today is going to be a creative/work day, or a laundry day, or a house-tidying day, or an outdoor adventure day, or a make-huge-vats-of-roasted-tomato-salsa kind of a day. I have to wake up, force myself out of the arms of my warm bed, shake off the dregs of dreams, and look the day square in the face. Sure there are days I HAVE to clean up, or I HAVE to meet a deadline. But for the most part, my family has indulged my whims (sometimes more patiently than others). Being a stay-at-home-mom affords me some luxury in that department. Of course I have to keep up with a little bit of work daily (be it around the house or on my computer) to keep all of our sanity. But some days I wake up and I know I am going to accomplish nothing more than writing all day, or a day-long love affair with new typography and what it can create. And that's fine. I've long since left behind the guilt trip of not being a well-balanced individual in this sense. It's better for me to go with the flow. So let's say you wake up and feel in your bones that you have to be creative. You have to start somewhere, right? Maybe you have TOO much of that vibrant creative force reeling through you, and you are having a hard time focusing it. Or maybe you know you want to create, but aren't sure just where to start. And possibly it is a creative work day, but you would rather it be a laundry day (does that person exist??). In any of these scenarios, it's always fun to have some creative inspiration an direction. Here are some things I do to mix it up, get things going, and focus my efforts (if they need some wrangling). That's right. Stalk other artists. See what's trending (I actually hate that word, but I am trying to warm to it). Check out what feels new and exciting to you. Borrow an idea without copying the original. Put your own twist on it. 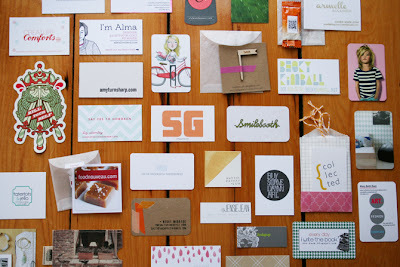 Find inspiration on Pinterest, Etsy, even sites like Minted or Paper Source. Catalog your favorite creative blogs (whether they be art, design, writing, painting, sewing), and refer to them often. Don't feel like you have to be entirely original all the time. You'll find as you put your own spin on an idea, that it will blossom into something unique. Some of my favorite creative blogs include How About Orange, Oh, Hello Friend, Cardigan Empire (more of a fashion/personal style inspiration blog), Craft Gawker, Holiday with Matthew Mead, Graphic Exchange, The Happiness Project, and Rachelle Gardner has excellent tips on writing. Also for writers, I recommend downloading the free guide that lists the 101 best websites for writers, found HERE. A word to the wise: Don't let a site like Pinterest run wild with your creativity! It is too easy to pin to your heart's content, only to find you have supersaturated your boards, and just wasted half of your day by following a creative tangent. Zero in on one or two things you would love to try, then revisit others as you have time. I think artists sometimes tend to find their niche and fly with it. And that is a wonderful thing that elevates work, and defines careers. But other creative pursuits can feed our minds and artistic eye. You'll be surprised where you find inspiration when you engage in something completely different. And if nothing else, you'll be coming back to the proverbial drawing board with fresh eyes. Try creating something new to you. Or revisit a talent you might have had in the past, but let fall by the wayside. If you paint, try felting. 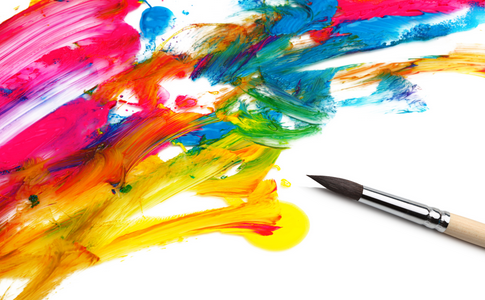 If you write, try watercolors. If you are a web designer, sculpt something out of clay. Make a piece of jewelry. Sew something simple. Write a poem and let it be really really bad. Bake a cake and don't worry about perfect icing. Finger paint with your children. Plant an herb garden in a pot. Or maybe it's even as simple as changing your medium that day. I often sketch my illustrations, scan them in to the computer, and then digitally color them in. But it feels completely different to physically hand-paint my sketches with watercolor. I can feel my brain working differently when I am holding a paintbrush vs. the mouse. You can also find a slew of gorgeously designed inspirational quotes to get you through the rough days, and enhance the good ones. Find many HERE. Post them where you'll see them most, then change them out to suit your needs. Creativity can often be a solitary pursuit. I had an amazing experience in school working with peers on projects, feeding off of our shared enthusiasm, new approaches, and bright ideas. I worked for a company where I was part of a team, and other creative minds swarmed around me non stop. I could reach out and grab inspiration any time I needed it. But when I became a freelance designer/illustrator, I found I had to really work for that lightening bolt. It got easier over time, but connecting with other creative individuals helped bridge that gap. I sought out blogs (even creating a few of my own) that fostered community. I started following people on Twitter, Blogger, Wordpress (and then followed some of their followers). Even Instagram has provided unexpected friendships with people I would call modern-day pen pals. The key to online connection is to make comments, email blog authors, and generally let yourself be known. Offer things that will benefit others, and you will find that in return. Maybe your process is to be wildly improvisational. Maybe you like a list of goals. Whatever it is, experimenting with process can be very helpful. I have found that many creative minds can benefit from a little structure. It not only keeps us focused on goals, but also helps us see our initial intent more clearly, actually encouraging creativity. Here is one of my favorite ways to work through a major project: Start with a creative device, continue with purpose, and end with a push. I had a wonderful thesis advisor in graduate school. She would encourage all kinds of ways to map out our project before diving in. Then we would plug along purposefully. Finally, when we thought we were finished, she would push us to find opportunities to enhance the results. For example, I might begin with a mind map, list out my ideas, or cast a wide net for creative images in the internet. That would spark all kinds of ideas that would then get narrowed down. Then I would begin my project. (This is the time for experimentation and maybe numerous drafts or versions of what you are creating.) Then once I would finish with what I thought was my very best work, my advisor would always make final suggestions on how I could improve. Every. Single. Time. And I thought I would die every single time. But I soon learned that adding extra visual texture, refining the text, or altering the typography would transform my work from good to great. I have since learned how to do this on my own—push myself almost over the edge. It's a skill that takes time to master (and I am still working on it). But I always know that once I think I am done, there's still something more—some extra little tweak that can make it sing. It's about recognizing the exceptional in yourself, and bringing it out. 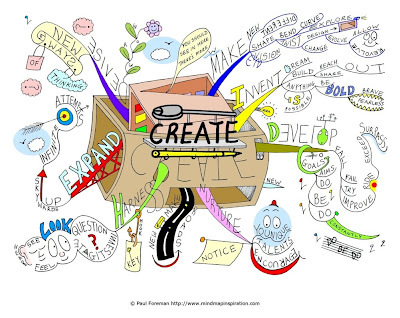 I hope this post has given you some new ideas to get that creative ball rolling! Be sure to share your ideas in the comments. I love to hear from readers. I really enjoyed reading this post! Thanks for all the great creative info. I first read it over at The Blog Guidebook and then found myself here- love your blog! You mention scanning your art and coloring it digitally- I have been wanting to try that. What program do you use or recommend for a beginner?